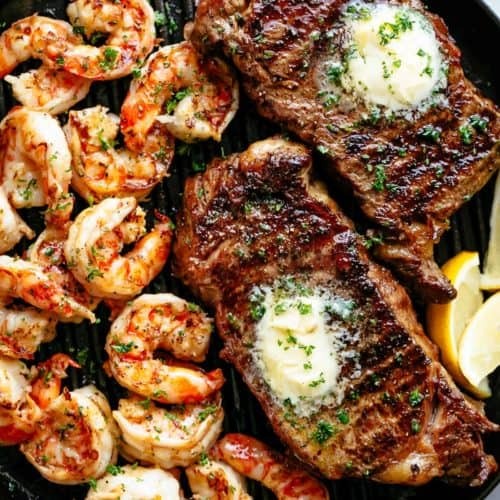 Grilled Steak & Shrimp slathered in garlic butter makes for the BEST steak recipe! Surf And Turf right at home! An incredible easy to make gourmet steak dinner that tastes like something out of a restaurant! 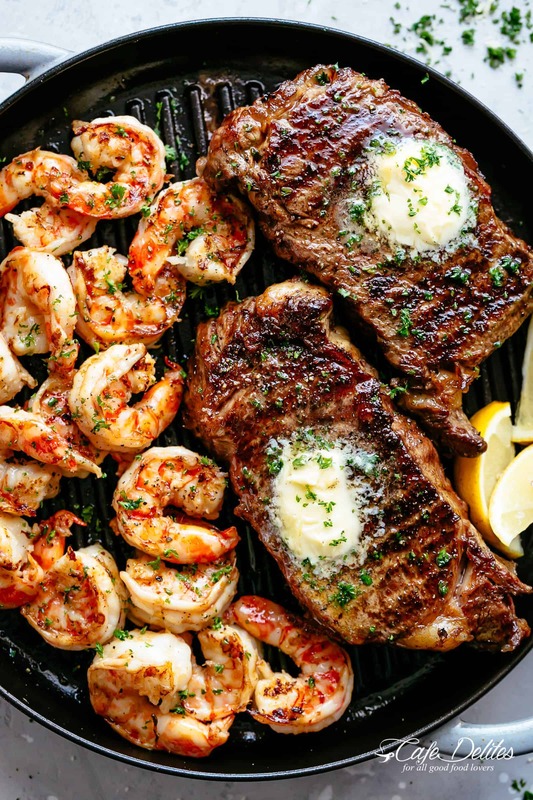 Garlic Butter Grilled Steak & Shrimp recipe is ready on the table in less than 15 minutes. Easy to make and PERFECT for the barbecue, or grill inside using a grill pan! Set up the grill — at least 15 minutes before you start grilling. Start with clean grill plates to prevent steaks from sticking when flipping. Preheat grill or barbecue — Your grill needs to be HOT! At least 450°F (230°C) to get a good sear and a crispy edges. Find the hottest areas by carefully and slowly waving your hand 6 inches above the grill plates. Lightly oil — Using tongs, lightly grease grill plates with a folded paper towel dipped in oil. Pat steaks dry — Let steaks sit out at room temperature for 15 minutes, then pat dry with paper towel to ensure the perfect sear. Season with salt and pepper, plus anything else you like: paprika, chili powder, cumin, garlic powder, etc. Flip with tongs — Use a pair of tongs instead of a barbecue fork to avoid piercing holes in the meat and releasing crucial juices. Flip only once during cook time to give them time to form that beautiful crust. You’ll know they are ready when they easily lift off the grill. Slather with garlic butter — the BEST part about this recipe. You can grill your steaks AND have delicious melted garlic butter running down them, infusing them with so.much.flavour. You’re going to use half here, saving the rest for your shrimp. Rest — Allow steaks to rest for a good 5 minutes before slicing to let the juices settle before serving. 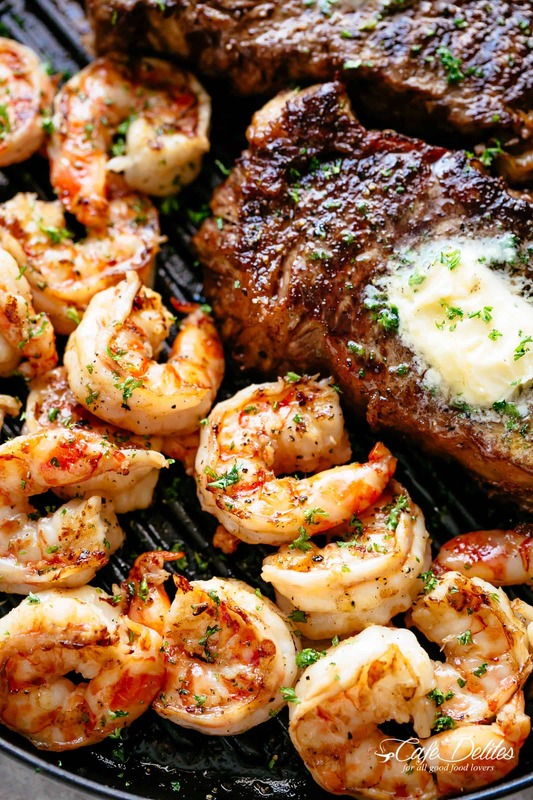 While steaks are resting, grill your shrimp, brushing them with the remaining butter. Get ready for a flavour explosion. How can you tell if grilled steak is done? I recommend removing steaks off the grill when they are around 5° below desired doneness as they continue cooking while resting! Reduce heat to medium and grill your shrimp for 5-6 minutes, depending not the size and thickness of your shrimp. Flip each one halfway through cook time, grilling until they turn nice and pink in colour while white and opaque on the inside. Grilled asparagus is my favourite side! Grilled Brussels sprouts, zucchini or broccoli are just as good! What wine goes well with this steak recipe? Looking for more steak recipes? Try these! While steaks are resting, melt remaining butter. Season shrimp with salt and pepper. Reduce heat to medium and grill your shrimp for 5-6 minutes, depending not the size and thickness of your shrimp. Flip each one halfway through cook time and continue cooking until they turn nice and pink in colour while white and opaque on the inside. 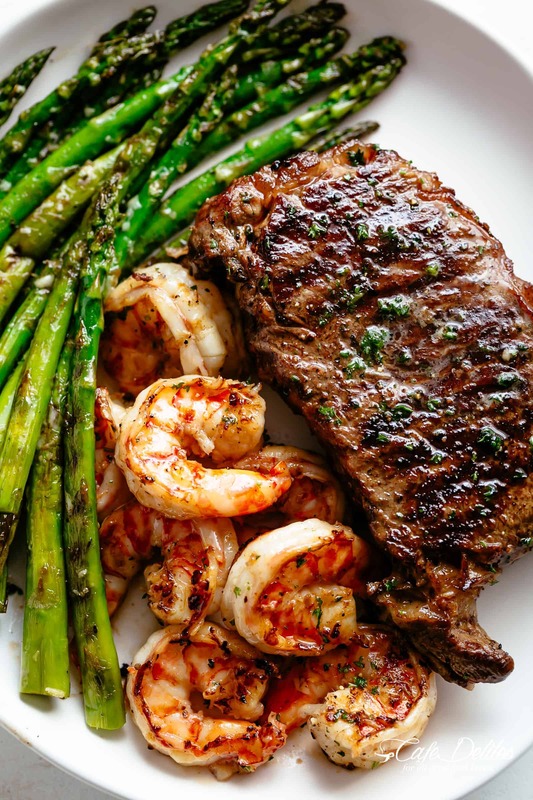 Toss remaining butter through shrimp and serve with steak! Tail on or off shrimp are fine. If grilling frozen shrimp, thaw first and pat dry with paper towel before grilling. I have been cooking and catering for over 40 years. This is probably one of the BEST dinners I have ever made. Typically once I cook it- I am not as excited to eat it. But this is different. I enjoyed every bit if it! So easy and so delicious. Can’t find the video for this recipe on this page. Is there a link somewhere? Hi Judy! I’m so sorry about that. The video is now included, or you can see it on Youtube here! I’m not sure what you mean by “Grill Plates”. Is this something you use on a charcoal grill? This looks heavenly! Your recipe is so easy to follow and very informative! I love that you have the nutrition facts. I cant wait to try this! How many tbsp butter are used for the garlic butter (step 1) and how many for the melted (step 4)? The ingredients say the butter is divided, but nowhere does it say what the division is. I apologize for the confusion. The ‘Butter’ is the melted butter (6 tablespoons) with the garlic and parsley. That mixture of butter will be what is divided IN HALF over the steaks and shrimp. I hope that clarifies and makes better sense. Thank you so much for choosing one of my recipes and following along with me! Sounds yummy! Recipe doesn’t mention what to do with the second half of the garlic butter. Melt on shrimp after? Baste while grilling? Yes, it is at the very end that you will toss the remaining butter over the shrimp and then serve! Hope that you enjoy! !